Like most of us, I do enjoy a good story. So two recent novels have been very worthwhile. 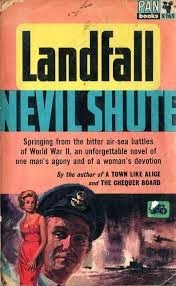 Nevil Shute is such a good story teller. His books are easy reads and in some ways quaint by contemporary standards (but then certain aspects of life were quaint in the 1940s! ), with several fairly innocent non-pc comments about the role of women and the class structure which pertained then. The book centers around the activities of a young pilot in the first year of the second world war (indeed the book was written in 1940). As usual with Shute there is interesting technical detail, but also at its heart the willingness of young men to serve our country. There's fascinating touches on the inter-relations between the Royal Navy and the RAF, a rather gentle romance, and a good angle on one of the many little stories which would have been easily lost within the grand larger theme of the war. A much heftier and punchier book by one of my favourite authors. For those who have enjoyed the Wallender series this is another great read. It is typically atmospheric with a stunning and disturbing opening. The characters are as ever, memorable and the story line somewhat complex but ties together brilliantly. At times it is perhaps a little more discursive than it needs to be, but Mankell's grasp of history and international relations is excellent and there is a genuine page-turning quality to the book.. There are a good few stories within the over-arching story, but I didn't get lost and I enjoyed the movement thought history and across continents. Its nearly 550 pages, but worth the effort.